"This takes a little longer but is truly worth the extra effort. You can use the apple filling as topping for ice cream, for apple crisp, apple pie, or anything else you like to top with apples." 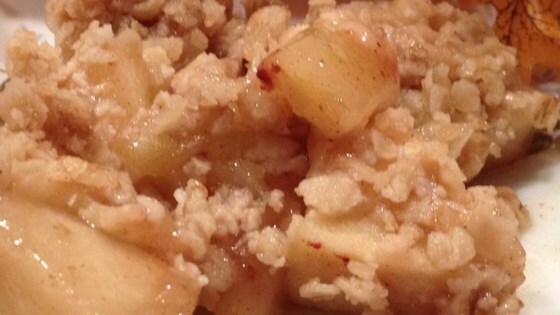 To Make Apple Filling: In a large saucepan combine water, cinnamon, sugar, and cornstarch. Mix well, then add apples to pan. Simmer over medium heat, stirring occasionally, until apples are tender. Pour apple filling into a 9x13 inch baking pan. To Make Topping: In a small bowl, combine oats, melted butter or margarine, and brown sugar. Mix well and sprinkle over apple filling. Bake in preheated oven for 20 minutes or until topping is golden brown. There must be an error in this recipe. I think it calls for too much cinnimon and not enough cornstarch. Almost tastes like apple flavored oat meal. Surely not my favorite. Should've read the reviews - too runny, a total waste of 9 apples! I don't know if it was my fault, but the topping just was not crispy/crunchy. My mom disliked this one and she usually loves my cooking. too runny and no crisp, cooked additional 30 minutes to no avail, maybe more corn starch?